My dear friend Stephanie is celebrating a milestone birthday this week! In honor of her, I'm featuring one of her "signature recipes," adapted for the mason jar. It's a sweet-savory salad featuring a unique combination of ingredients, hearty whole grains, a triple-dose of protein, and copious amounts of her daughter's favorite leafy green, baby spinach. Happy Birthday, Steph! 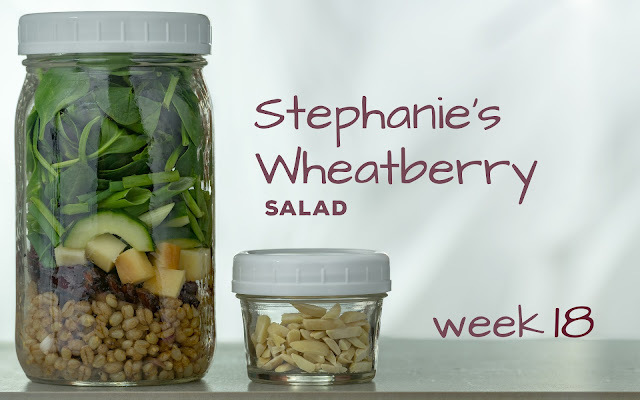 Make the marinaded wheatberries: bring a small pan of water to a boil. Add the wheatberries and boil gently for 30 minutes, stirring occasionally. Add the pearl barley and continue boiling for 40 minutes, stirring occasionally. Drain the grains, rinse well under cool water, and drain again. Combine the garlic, salt, balsamic vinegar, and olive oil in a pint-sized mason jar. Puree and emulsify the dressing using a handheld stick blender. (Alternately, puree and emulsify the dressing ingredients using a blender or mini food processor.) Combine the cooked grains, dressing, and minced red onion. Pack the salads: divide the marinaded wheat berries evenly between 4 tall quart-sized containers. 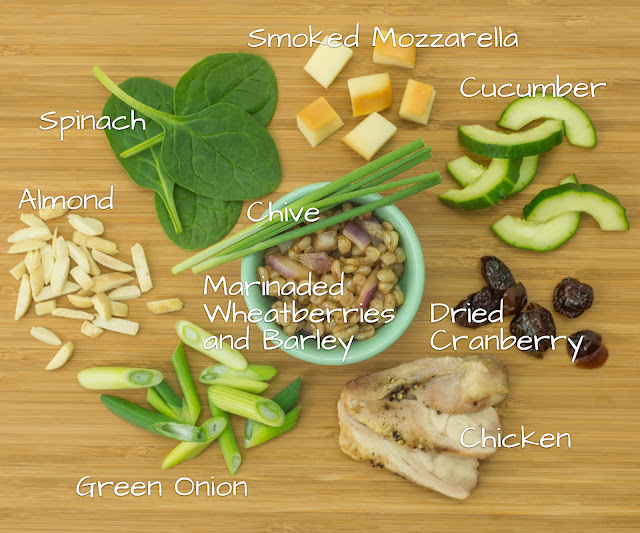 Layer the chicken, dried cranberries, mozzarella, cucumber, green onions, chives, and spinach in the jars. Divide the almonds evenly among 4 2-ounce jars or snack-size zip-top bags for each salad. Refrigerate until serving. Enjoy your salad: invert your salad onto a plate or into a bowl, and top with almonds. TIME-SAVING TIPS: Use rotisserie chicken in place of the grilled or roasted chicken breasts. SPECIAL DIET SWAPS: For a vegetarian salad, omit the chicken. For a vegan salad, omit the chicken and substitute smoked tofu for the smoked mozzarella. For a gluten-free salad, substitute 2 cups prepared quinoa for the wheatberry/barley mixture. For a nut-free salad, substitute roasted sunflower seeds for the almonds. Thank you to Pinch of Yum for the inspiration for this salad. When I saw her recipe for "Vietnamese Chicken Salad with Rice Noodles" several years ago, I knew I had to make a vegetarian version ASAP. The sweet-salty-spicy-tangy dressing called to me, and I have an almost unholy love of rice noodles. I gathered and prepared my ingredients, swapping in browned tofu for the chicken, and I also decided to pack my salads "upside down," in a few quart-sized mason jars I had lying around, in imitation of my coworker who had been bringing salads to work for lunch in just such a fashion. This recipe was, indeed, my first-ever attempt at a mason jar salad lunch! I have fond memories of enjoying this salad while hanging out in the car in-between home visits on a cold, grey, January afternoon. This salad brightened up my day then, and I hope it does to yours this week! Make the serrano-lime dressing: combine the garlic, vinegar, sugar, soy sauce, lime juice, and oil in a pint-sized mason jar. Puree and emulsify the dressing using a handheld stick blender. (Alternately, puree and emulsify the dressing ingredients using a blender or mini food processor.) Stir in the sliced serranos. Pack the salads: divide the dressing evenly between 4 tall quart-sized containers. 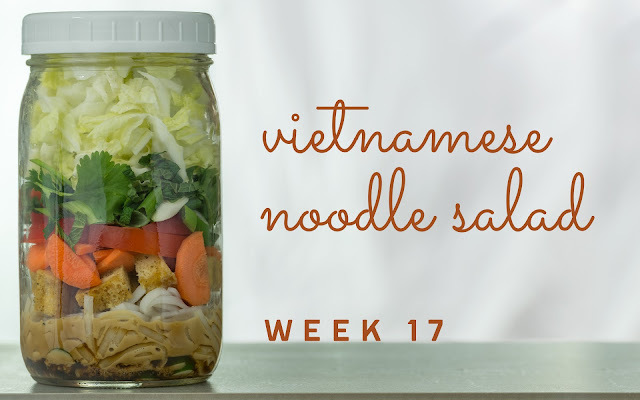 Layer the noodles, chicken, carrot, bell pepper, green onion, cilantro, mint, and cabbage in the jars. Refrigerate until serving. TIME-SAVING TIPS: Use rotisserie chicken in place of the grilled or roasted chicken thighs. SPECIAL DIET SWAPS: For a vegetarian/vegan salad, substitute grilled or broiled tofu for the chicken.. For gluten-free diners, use gluten-free tamari. This salad is nut-free as-is. We all have our favorite sources for rock-star recipes: battered-splattered-dog-eared cookbooks, traditional family favorites, and, in the last 10 years or so, the Internet. Those of us who cook frequently from the Internet can all agree ... not all online recipes are created equal! I'm sure we all have our go-to sites for recipes that rarely disappoint - my bookmarks skew generally in the direction of Real Simple, Smitten Kitchen, New York Times Cooking, King Arthur Flour, Pinch of Yum, and The Kitchn. This week's salad is inspired by this sandwich recipe, courtesy of The Kitchn. While the linked sandwich is pretty much my favorite spring lunch ever, (and packs especially well for squelchy early-spring hikes,) sometimes I want a lunch that is more greens-forward. Salad to the rescue! Make the pickled onions: toss the sliced red onion with the red wine vinegar and pinch kosher salt. Allow to marinade at room temperature for 20+ minutes. Drain, reserving the onions. Make the croutons: preheat the oven to 425 degrees Fahrenheit. Toss the bread cubes with the 2 tbsp oil, 1/4 tsp salt, 1/4 tsp pepper, and large garlic clove. Bake the croutons for 10 - 15 minutes, or until evenly dried and golden brown. Cool. 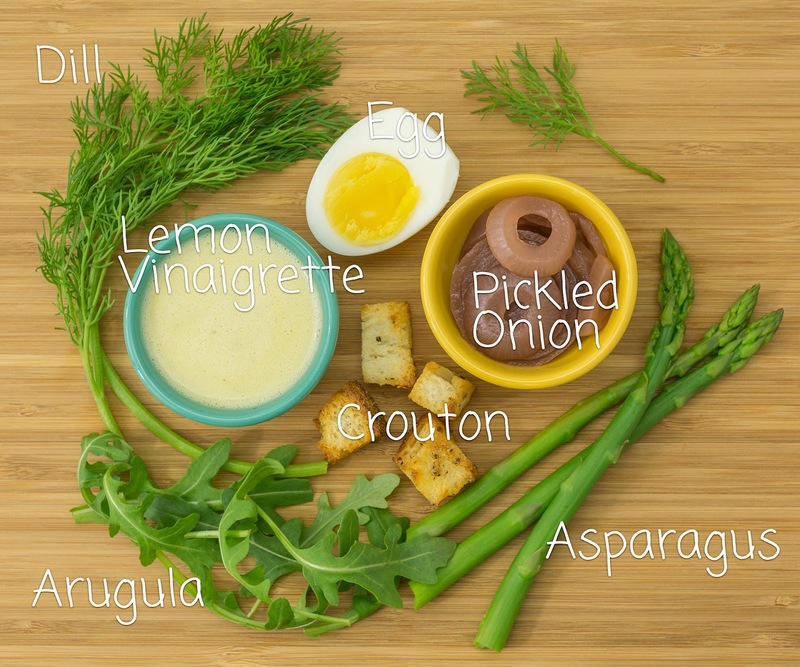 Make the lemon vinaigrette: combine the lemon zest and juice, garlic clove, 1/4 tsp salt, 1/4 tsp pepper, 1/4 tsp sugar, 1/4 c olive oil, and 1/2 tsp dijon mustard. Puree and emulsify the dressing using a handheld stick blender. Pack the salads: divide the dressing evenly between 4 tall quart-sized containers. 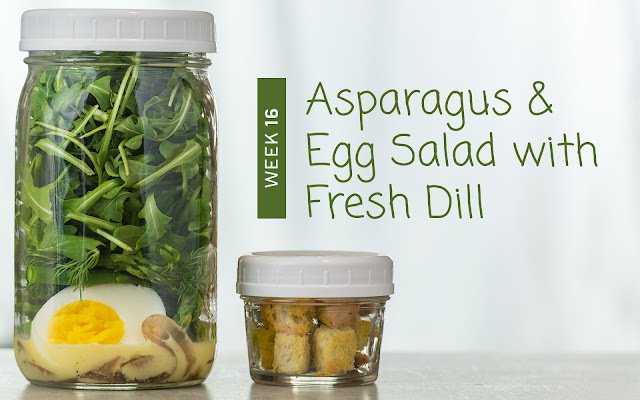 Layer the pickled onion, egg, asparagus, dill, and arugula in the jars. Divide the croutons evenly between 4 snack-size zip-top bags for each salad. Refrigerate until serving. 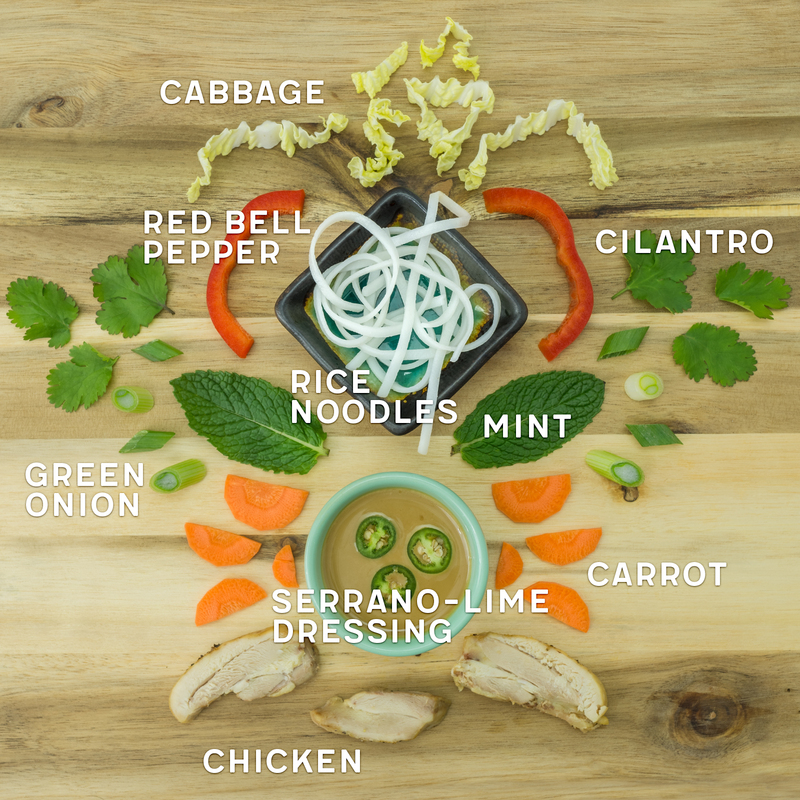 Enjoy your salad: invert your salad onto a plate or into a bowl. Top with croutons. TIME-SAVING TIPS: Use prepared croutons, pre-cooked/peeled hard-boiled eggs, and frozen asparagus (thawed and drained,) in place of the homemade croutons, home-cooked egg, and steamed asparagus. SPECIAL DIET SWAPS: This salad is vegetarian and nut-free as-is. For a vegan salad, double the dressing, marinade a 14-oz package of extra-firm tofu in half the dressing, then grill or broil the tofu and substitute for the hard-boiled egg. For gluten-free diners, substitute your favorite gluten-free bread for the baguette. Hellooooooooo spring! We have been enjoying warmer temperatures and loads of sunshine here in Minnesota the past couple weeks, and I'm thrilled to see chives and garlic beginning to poke up in my garden. 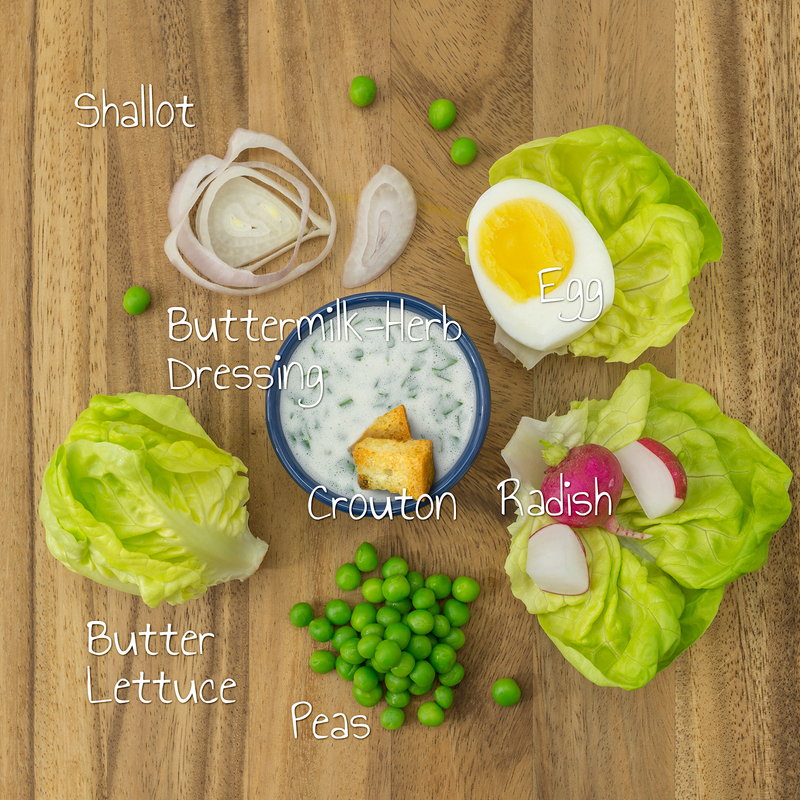 While it's still a bit too early to expect any substantial produce from my garden yet, I can rely on grocery store staples for this ultra-springy salad - green peas, radishes, shallots, and tender lettuce combine with hard-boiled egg (anybody have a surplus of those this week??) a creamy-herby dressing, and garlicky homemade croutons for a fresh, bright, super-flavorful salad to welcome in this new season! Enjoy! Make the croutons: preheat the oven to 425 degrees Fahrenheit. Toss the bread cubes with the oil, salt, pepper, and large garlic clove. Bake the croutons for 10 - 15 minutes, or until evenly dried and golden brown. Cool. Make the buttermilk-herb dressing: combine the buttermilk, Greek yogurt, mayonnaise, and garlic clove in a pint-sized mason jar. Puree and emulsify the dressing using a handheld stick blender. (Alternately, puree and emulsify the dressing ingredients using a blender or mini food processor.) Fold in the parsley and chives. Pack the salads: divide the dressing evenly among 4 tall quart-sized containers. 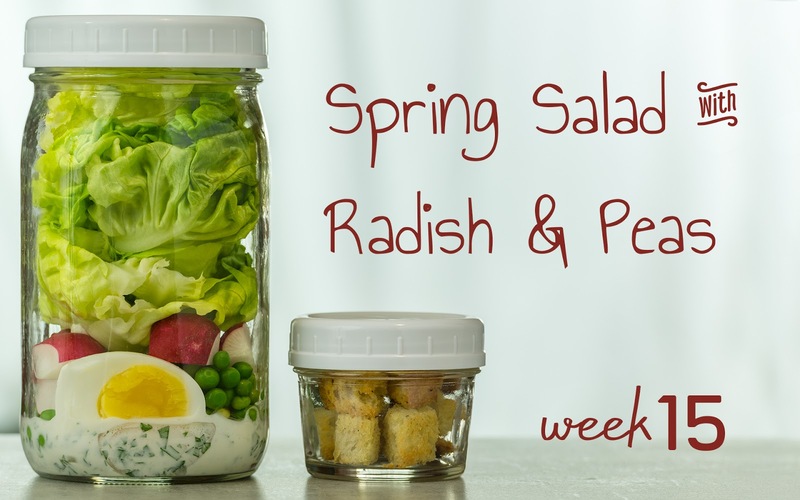 Layer the shallots, green peas, egg, radishes, and lettuce in the jars. Divide the croutons evenly among 4 snack-sized zip-top bags for each salad. Refrigerate until serving. TIME-SAVING TIPS: Use prepared croutons in place of the homemade croutons. Use your favorite prepared creamy ranch or buttermilk dressing for the homemade dressing. SPECIAL DIET SWAPS: This salad is vegetarian and nut-free as-is. For a vegan option, use your favorite creamy vegan salad dressing, and substitute grilled or broiled tofu steaks for the hard-boiled egg. Substitute your favorite gluten-free bread for the baguette for a gluten-free option. This salad doesn't look like much at first glance, but appearances can be deceiving. 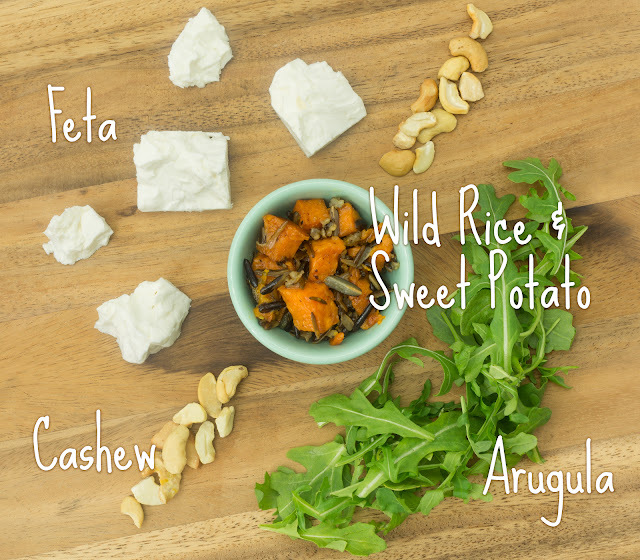 I love everything about this salad: the slightly caramelized sweet potato, chewy and bitter wild rice, tangy and lemony dressing, salty feta, rich and crunchy cashews, and peppery bite from the arugula. This is one of my favorites, and makes its way into regular rotation at our house for healthy, convenient, grab-n-go lunches. If you enjoy this salad half as much as I do, you won't be sorry you made it! Enjoy! Roast the sweet potatoes: preheat the oven to 425 degrees Fahrenheit. Toss the sweet potatoes with the canola oil and chili powder. Roast until the potatoes begin to brown around the edges. Cool. 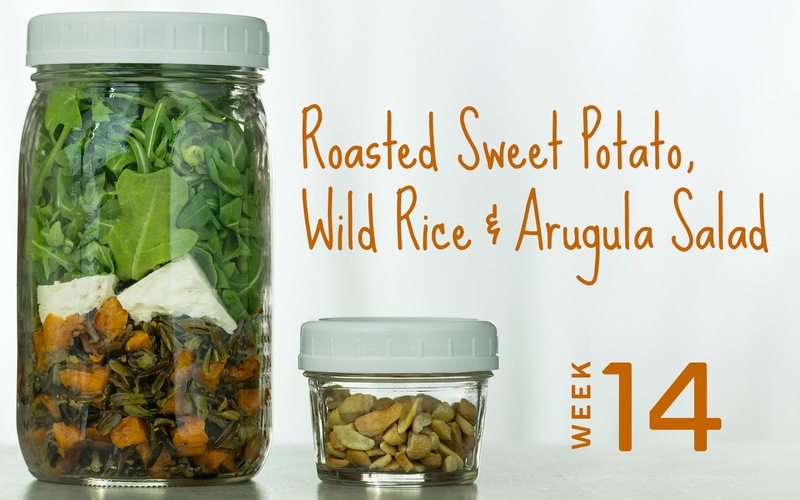 Pack the salads: combine the dressing, cooked wild rice, and roasted sweet potato and divide evenly among 4 tall quart-sized containers. Layer the feta and arugula in the jars. Divide the cashews evenly among 4 2-ounce jars or snack-size zip-top bags for each salad. Refrigerate until serving. Enjoy your salad: invert your salad onto a plate or into a bowl. Top with cashews. TIME-SAVING TIPS: Use 2 cups pre-cooked wild rice for the boiled wild rice. SPECIAL DIET SWAPS: This salad is vegetarian and gluten-free as-is. For a vegan salad, omit the feta, and substitute agave for the honey in the dressing. Substitute unsalted sunflower seeds for the cashews to accommodate tree nut allergies.